Some changes have happened to the design of my tags over the last little while. The more I washed my original proto-type bibs, the more I noticed that the tags just weren’t holding up as well as I’d like. 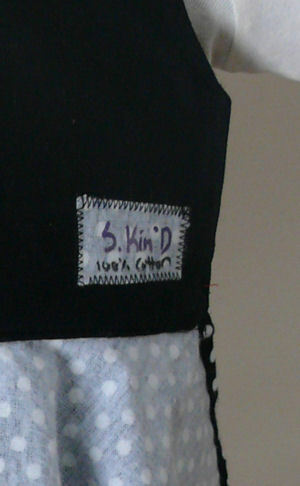 So when I started working on my third design (The Rockabilly Apron Bib) I decided to try out a new tag. It’s still made from leftover scraps of material, but it’s incorporated and sewn on in a more effective way. Check an example out below! ~ by Stephanie on March 27, 2011.